On a recent fall afternoon, I visited Mystic, Connecticut’s Oyster Club restaurant, where chef James Wayman prepares an eclectic menu using local ingredients and daily inspiration. 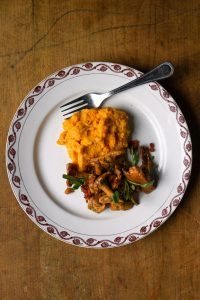 On this particular visit, his sweet potato pudding caught my eye—an autumnal palette of golden orange purée strewn with the reds and browns of just-foraged porcini, golden chanterelle, and chestnut boletus mushrooms. I took a bite: The mushrooms delivered an earthy aroma and an array of subtle flavors ranging from savory to delicate and nutty. But the real treasure lay underneath—a remarkable pudding with the silky texture of crème brûlée, in which the taste of sweet potatoes mingled with that of bacon fat, caramelized white onions, fresh sage, and wild bay. It was nothing short of thrilling.